Child process invocation, monitoring and control. This class works only in the application's main thread. This class allows a KDE application to start child processes without having to worry about UN*X signal handling issues and zombie process reaping. DontCare -- The child process is invoked and both the child process and the parent process continue concurrently. The process is started in an own session (see setsid(2)). NotifyOnExit -- The child process is invoked and both the child and the parent process run concurrently. 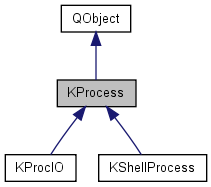 When the child process exits, the KProcess instance corresponding to it emits the Qt signal processExited(). Since this signal is not emitted from within a UN*X signal handler, arbitrary function calls can be made. Be aware: When the KProcess object gets destructed, the child process will be killed if it is still running! This means in particular, that it usually makes no sense to use a KProcess on the stack with NotifyOnExit. OwnGroup -- like NotifyOnExit, but the child process is started in an own process group (and an own session, FWIW). The behavior of kill() changes to killing the whole process group - this makes this mode useful for implementing primitive job management. It can be used to work around broken wrapper scripts that don't propagate signals to the "real" program. However, use this with care, as you disturb the shell's job management if your program is started from the command line. Block -- The child process starts and the parent process is suspended until the child process exits. (Really not recommended for programs with a GUI.) In this mode the parent can read the child's output, but can't send it any input. KProcess also provides several functions for determining the exit status and the pid of the child process it represents. When the child process exits, the slot will be invoked. KProcess supports communication with the child process through stdin/stdout/stderr. writeStdin() -- Transmit data to the child process' stdin. When all data was sent, the signal wroteStdin() is emitted. When data arrives at stdout or stderr, the signal receivedStdout() resp. receivedStderr() is emitted. You can shut down individual communication channels with closeStdin(), closeStdout(), and closeStderr(), resp. Definition at line 125 of file kprocess.h. More or less intuitive constants for use with setPriority(). Definition at line 568 of file kprocess.h. Modes in which the communication channel can be opened. If NoRead is specified in conjunction with Stdout, no data is actually read from Stdout but only the signal receivedStdout(int fd, int &len) is emitted. CTtyOnly tells setUsePty() to create a PTY for the process and make it the process' controlling TTY, but does not redirect any I/O channel to the PTY. If MergedStderr is specified in conjunction with Stdout, Stderr will be redirected onto the same file handle as Stdout, i.e., all error output will be signalled with receivedStdout(). Don't specify Stderr if you specify MergedStderr. Definition at line 152 of file kprocess.h. Run-modes for a child process. DontCare The application does not receive notifications from the subprocess when it is finished or aborted. NotifyOnExit The application is notified when the subprocess dies. Block The application is suspended until the started process is finished. OwnGroup Same as NotifyOnExit, but the process is run in an own session, just like with DontCare. Definition at line 164 of file kprocess.h. Definition at line 120 of file kprocess.cpp. Definition at line 145 of file kprocess.cpp. If the process is running when the destructor for this class is called, the child process is killed with a SIGKILL, but only if the run mode is not of type DontCare. Processes started as DontCare keep running anyway. Definition at line 225 of file kprocess.cpp. Lets you see what your arguments are for debugging. Definition at line 467 of file kprocess.h. Called by slotChildError() this function copies data arriving from the child process' stderr to the respective buffer and emits the signal receivedStderr(). Definition at line 859 of file kprocess.cpp. Called by slotChildOutput() this function copies data arriving from the child process' stdout to the respective buffer and emits the signal receivedStdout(). Definition at line 836 of file kprocess.cpp. Clear a command line argument list that has been set by using operator<<. Definition at line 293 of file kprocess.cpp. Close stdin, stdout, stderr and the pty. Definition at line 717 of file kprocess.cpp. Deletes the optional utmp entry and closes the pty. Make sure to shut down any communication links that are using the pty before calling this function. false if the pty is not open (any more). Definition at line 702 of file kprocess.cpp. Shuts down the Stderr communication link. If no pty is used, any further attempts by the child to write to its stderr file descriptor will cause it to receive a SIGPIPE. false if no Stderr communication link exists (any more). Definition at line 688 of file kprocess.cpp. Shuts down the Stdin communication link. If no pty is used, this causes "EOF" to be indicated on the child's stdin file descriptor. false if no Stdin communication link exists (any more). Definition at line 660 of file kprocess.cpp. Shuts down the Stdout communication link. If no pty is used, any further attempts by the child to write to its stdout file descriptor will cause it to receive a SIGPIPE. false if no Stdout communication link exists (any more). Definition at line 674 of file kprocess.cpp. Cleans up the communication links to the child after it has exited. This function should act upon the values of pid() and runs. See the kprocess.cpp source for details. If pid() returns zero, the communication links should be closed only. if pid() returns non-zero and runs is false, all data immediately available from the communication links should be processed before closing them. if pid() returns non-zero and runs is true, the communication links should be monitored for data until the file handle returned by KProcessController::theKProcessController->notifierFd() becomes ready for reading - when it triggers, runs should be reset to false, and the function should be immediately left without closing anything. if runs is true, the communication links are monitored for data until all of them have returned EOF. Note that if any system function is interrupted (errno == EINTR) the polling loop should be aborted. if runs is false, all data immediately available from the communication links is processed. Definition at line 1037 of file kprocess.cpp. Called right after a (successful) fork(), but before an exec() on the child process' side. It usually duplicates the in, out and err file handles to the respective standard I/O handles. Definition at line 987 of file kprocess.cpp. Called right after a (successful) fork() on the parent side. This function will usually do some communications cleanup, like closing in, out and out. Furthermore, it must also create the QSocketNotifiers innot, outnot and errnot and connect their Qt signals to the respective KProcess slots. For a more detailed explanation, it is best to have a look at the default implementation in kprocess.cpp. Definition at line 942 of file kprocess.cpp. Checks whether a killed process dumped core. true if signalled() returns true and the process dumped core. Note that on systems that don't define the WCOREDUMP macro, the return value is always false. Definition at line 606 of file kprocess.cpp. Detaches KProcess from child process. All communication is closed. No exit notification is emitted any more for the child process. Deleting the KProcess will no longer kill the child process. Note that the current process remains the parent process of the child process. Definition at line 240 of file kprocess.cpp. Returns the signal the process was killed by. the signal number that caused the process to exit. Note that this value is not valid if signalled() returns false. Definition at line 622 of file kprocess.cpp. Returns the exit status of the process. the exit status of the process. Note that this value is not valid if normalExit() returns false. Definition at line 616 of file kprocess.cpp. Definition at line 318 of file kprocess.h. Checks whether the process is running. Definition at line 504 of file kprocess.cpp. Stop the process (by sending it a signal). signo The signal to send. The default is SIGTERM. true if the signal was delivered successfully. Definition at line 493 of file kprocess.cpp. Checks whether the process exited cleanly. true if the process has already finished and has exited "voluntarily", ie: it has not been killed by a signal. Definition at line 594 of file kprocess.cpp. Sets the executable and the command line argument list for this process, in a single method call, or add a list of arguments. Definition at line 268 of file kprocess.cpp. Similar to previous method, takes a QCString, supposed to be in locale 8 bit already. Definition at line 276 of file kprocess.cpp. Similar to previous method, takes a char *, supposed to be in locale 8 bit already. Definition at line 281 of file kprocess.cpp. Sets the executable and the command line argument list for this process. p << "ls" << "-l" << "/usr/local/bin"
Definition at line 287 of file kprocess.cpp. If it is called after the process has exited, it returns the process id of the last child process that was created by this instance of KProcess. Calling it before any child process has been started by this KProcess instance causes pid() to return 0.
the pid of the process or 0 if no process has been started yet. Definition at line 511 of file kprocess.cpp. Emitted after the process has terminated when the process was run in the NotifyOnExit (==default option to start() ) or the Block mode. Immediately called after a successfully started process in NotifyOnExit mode has exited. This function normally calls commClose() and emits the processExited() signal. Definition at line 821 of file kprocess.cpp. Obtains the pty object used by this process. The return value is valid only after setUsePty() was used with a non-zero argument. The pty is open only while the process is running. Definition at line 803 of file kprocess.cpp. This function can be used to quote an argument string such that the shell processes it properly. This is e. g. necessary for user-provided file names which may contain spaces or quotes. It also prevents expansion of wild cards and environment variables. Definition at line 809 of file kprocess.cpp. Emitted, when output from the child process has been received on stderr. To actually get this signal, the Stderr communication link has to be turned on in start(). You should copy the information contained in buffer to your private data structures before returning from the slot. buflen The number of bytes that are available. Emitted when output from the child process has been received on stdout. To actually get this signal, the Stdout communication link has to be turned on in start() and the NoRead flag must have been passed. You will need to explicitly call resume() after your call to start() to begin processing data from the child process' stdout. This is to ensure that this signal is not emitted when no one is connected to it, otherwise this signal will not be emitted. The data still has to be read from file descriptor fd. Emitted, when output from the child process has been received on stdout. To actually get this signal, the Stdout communication link has to be turned on in start(). Resume processing of data from stdout of the child process. Definition at line 654 of file kprocess.cpp. Returns whether the started process will drop any setuid/setgid privileges or whether it will keep them. Definition at line 204 of file kprocess.cpp. Specify the actual executable that should be started (first argument to execve) Normally the the first argument is the executable but you can override that with this function. Definition at line 250 of file kprocess.cpp. Adds the variable name to the process' environment. This function must be called before starting the process. Definition at line 171 of file kprocess.cpp. Sets the executable to be started with this KProcess object. Returns false if the process is currently running (in that case the executable remains unchanged). Definition at line 255 of file kprocess.cpp. Sets the scheduling priority of the process. prio the new priority in the range -20 (high) to 19 (low). false on error; see setpriority(2) for possible reasons. Definition at line 210 of file kprocess.cpp. Controls whether the started process should drop any setuid/setgid privileges or whether it should keep them. Note that this function is mostly a dummy, as the KDE libraries currently refuse to run with setuid/setgid privileges. Definition at line 198 of file kprocess.cpp. This function is called from start() right before a fork() takes place. According to the comm parameter this function has to initialize the in, out and err data members of KProcess. This function should return 1 if setting the needed communication channels was successful. The default implementation is to create UNIX STREAM sockets for the communication, but you could reimplement this function to establish a TCP/IP communication for network communication, for example. Definition at line 874 of file kprocess.cpp. Sets up the environment according to the data passed via setEnvironment(). Definition at line 183 of file kprocess.cpp. Specify whether to create a pty (pseudo-terminal) for running the command. This function should be called before starting the process. comm for which stdio handles to use a pty. Note that it is not allowed to specify Stdout and Stderr at the same time both here and to start (there is only one pty, so they cannot be distinguished). Definition at line 790 of file kprocess.cpp. Specify whether to start the command via a shell or directly. The default is to start the command directly. If useShell is true shell will be used as shell, or if shell is empty, /bin/sh will be used. When using a shell, the caller should make sure that all filenames etc. are properly quoted when passed as argument. shell the path to the shell that will execute the process, or 0 to use /bin/sh. Use getenv("SHELL") to use the user's default shell, but note that doing so is usually a bad idea for shell compatibility reasons. Definition at line 765 of file kprocess.cpp. Changes the current working directory (CWD) of the process to be started. Definition at line 177 of file kprocess.cpp. Checks whether the process was killed by a signal. true if the process has already finished and has not exited "voluntarily", ie: it has been killed by a signal. Definition at line 600 of file kprocess.cpp. This slot gets activated when data from the child's stderr arrives. Definition at line 738 of file kprocess.cpp. This slot gets activated when data from the child's stdout arrives. Definition at line 731 of file kprocess.cpp. Called when another bulk of data can be sent to the child's stdin. If there is no more data to be sent to stdin currently available, this function must disable the QSocketNotifier innot. Definition at line 745 of file kprocess.cpp. For a detailed description of the various run modes and communication semantics, have a look at the general description of the KProcess class. Note that if you use setUsePty( Stdout | Stderr, <bool> ), you cannot use Stdout | Stderr here - instead, use Stdout only to receive the mixed output. The process is already running. The command line argument list is empty. The the comm parameter is incompatible with the selected pty usage. The starting of the process failed (could not fork). The executable was not found. runmode The Run-mode for the process. comm Specifies which communication links should be established to the child process (stdin/stdout/stderr). By default, no communication takes place and the respective communication signals will never get emitted. Definition at line 298 of file kprocess.cpp. Suspend processing of data from stdout of the child process. Definition at line 648 of file kprocess.cpp. Reimplemented in KShellProcess, and KProcIO. Definition at line 1107 of file kprocess.cpp. Suspend execution of the current thread until the child process dies or the timeout hits. This function is not recommended for programs with a GUI. timeout timeout in seconds. -1 means wait indefinitely. true if the process exited, false if the timeout hit. Definition at line 528 of file kprocess.cpp. Transmit data to the child process' stdin. The process is not currently running. This implies that you cannot use this function in Block mode. Communication to stdin has not been requested in the start() call. Transmission of data to the child process by a previous call to writeStdin() is still in progress. Please note that the data is sent to the client asynchronously, so when this function returns, the data might not have been processed by the child process. That means that you must not free buffer or call writeStdin() again until either a wroteStdin() signal indicates that the data has been sent or a processExited() signal shows that the child process is no longer alive. If all the data has been sent to the client, the signal wroteStdin() will be emitted. This function does not work when the process is start()ed in Block mode. Definition at line 628 of file kprocess.cpp. Emitted after all the data that has been specified by a prior call to writeStdin() has actually been written to the child process. The list of the process' command line arguments. The first entry in this list is the executable itself. Definition at line 691 of file kprocess.h. Lists the communication links that are activated for the child process. Should not be modified from derived classes. Definition at line 847 of file kprocess.h. The socket descriptors for stderr. Definition at line 828 of file kprocess.h. The socket notifier for err. Definition at line 841 of file kprocess.h. The socket descriptors for stdin. Definition at line 824 of file kprocess.h. The socket notifier for in. Definition at line 833 of file kprocess.h. The buffer holding the data that has to be sent to the child. Definition at line 866 of file kprocess.h. The number of bytes already transmitted. Definition at line 870 of file kprocess.h. The total length of input_data. Definition at line 874 of file kprocess.h. If false, the child process' effective uid & gid will be reset to the real values. Definition at line 729 of file kprocess.h. The socket descriptors for stdout. Definition at line 820 of file kprocess.h. The socket notifier for out. Definition at line 837 of file kprocess.h. The PID of the currently running process. You should not modify this data member in derived classes. Please use pid() instead of directly accessing this member since it will probably be made private in later versions of KProcess. Definition at line 712 of file kprocess.h. How to run the process (Block, NotifyOnExit, DontCare). You should not modify this data member directly from derived classes. Definition at line 696 of file kprocess.h. true if the process is currently running. You should not modify this data member directly from derived classes. Please use isRunning() for reading the value of this data member since it will probably be made private in later versions of KProcess. Definition at line 703 of file kprocess.h. The process' exit status as returned by waitpid(). You should not modify the value of this data member from derived classes. You should rather use exitStatus() than accessing this data member directly since it will probably be made private in further versions of KProcess. Definition at line 721 of file kprocess.h.